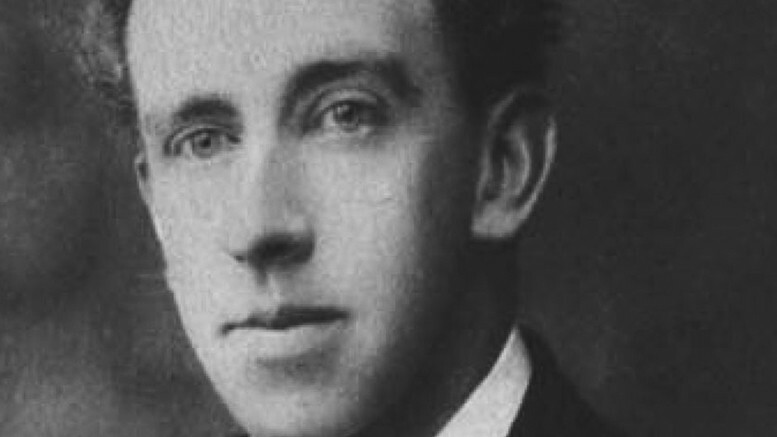 Thomas MacDonagh was a teacher, a playwright, and a member of the provisional government that declared the Proclamation of the Irish Republic in 1916. Born in the village of Cloughjordan in County Tipperary in 1878 his parents, Joseph and Mary Louise née Parker, were both teachers and Thomas was to follow in their footsteps. Educated initially by the Holy Ghost Fathers at Rockwell College in Cashel, McDonagh thought that he too was called to become a priest. However it was not to be and instead, he found that his vocation lay in the education of children. After Rockwell, MacDonagh spent some time in France before resuming his studies at University College, Dublin. Afterwards he was to take up a position at St. Kieran’s College in Kilkenny and later, St. Colman’s College in Fermoy County Cork, where he taught English, Latin and French. In 1901, he joined the Gaelic League, and soon developed a very keen interest in the Irish language. In order to perfect his use of Irish, MacDonagh travelled to the Aran Islands where he met and befriended Padraig Pearse. MacDonagh’s friendship with Pearse and common interest in the language and culture of the Irish people would lead both men, in 1908, to found St. Enda’s School (Scoil Éanna) in Ranelagh, Dublin. The school, which was bi-lingual, provided boys with a secondary education and was dedicated to the preservation of the language and culture of Ireland. As his time as a teacher MacDonagh was producing works of poetry and in 1908 he would see his play “When The Dawn Is Come” performed in the Abbey Theatre under the direction of John Millington Synge. In 1910 he was awarded a B.A. by U.C. D. and in 1911 he was awarded a M.A. in English literature. Around this time Thomas was hired as a private tutor of Irish by Joseph Mary Plunkett. The two men would become firm friends and fall in love with two sisters Muriel and Grace Gifford. Although Protestant, the two Gifford girls were deeply involved in Irish nationalist activities, as where some others of their many siblings. Thomas resigned his position at St. Enda’s and assumed a post lecturing at University College Dublin and married Muriel Gifford in 1912, against the approval of Muriel’s mother. Muriel was experiencing periods of ill health following the birth of Donagh their first child. A second child, Barbara, was born in 1915. In 1914, along with Joseph Plunkett and Edward Martyn, MacDonagh established The Irish Theatre and was managed by his brother, John MacDonagh. All the time MacDonagh was becoming much more radicalised in regards to Irish politics. In 1913 he joined the Irish Volunteers and participated in the Howth gun running affair and when the Volunteers split over the question of enlisting in the British Army to fight in World War 1, MacDonagh joined with the minority who refused to aid Britain. In 1915 MacDonagh went a step further and joined the Irish Republican Brotherhood and a year later, in early April 1916 he was elected to their Military Council. He would assist with the planning of the 1916 Easter Rising and was a major contributor to the contents of the Proclamation of Independence which bears his signature along with six others. On Easter morning 1916, as Padraig Pearse read out the Proclamation of the Irish Republic from the front of the GPO in Dublin. Thomas MacDonagh, took command of the 2nd Battalion of the rebel forces in Jacobs Biscuit Factory on Bishop Street in Dublin. He had as his vice commanders Major John MacBride who had fought against the British during the Boer War and Michael O’Hanrahan. His brother John also stood alongside him. Jacobs Factory saw little of the violence and when Pearse ordered the surrender on the following Friday, MacDonagh reluctantly obeyed. On the 2nd May, Thomas MacDonagh, as a signatory of the Proclamation, was court-martialled and sentenced to death by firing squad. MacDonagh sent word to his wife but the messages didn’t reach her in time. Before his execution he was visited by his sister Mary MacDonagh (Sister Francesca) and when she requested water for her brother his guards refused, but she was allowed to put her rosary around his neck. It was retrieved after his death. Thomas MacDonagh was executed by firing squad at 3:30am on the 3rd of May 1916 at Kilmainham gaol in Dublin city. MacDonagh was well known in Irish literary circles, his friends and acquaintances were amongst the most important writers, poets, artist’s dramatists that Ireland had at that time. His own works would provide some income for his distressed family. Unfortunately his wife was not to survive him for very long as she drowned in 1917 whilst swimming out to the Skerries.